It had all the ingredients for a heady cocktail of modern-day wheeling and dealing. Nine entrepreneurs seeking equity or loan investments through crowdfunding. 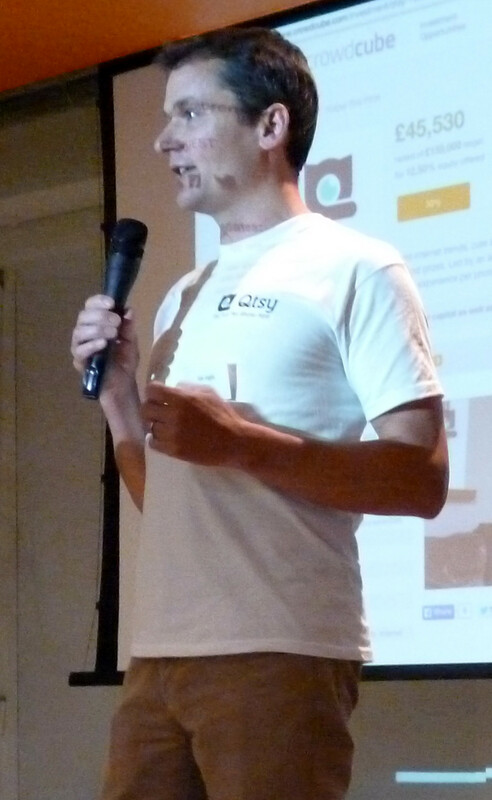 Each giving quickfire three minute pitches followed by a couple of questions from a Crowdcube convenor in front of an audience of around a hundred people. These were potential investors and some would-be entrepreneurs who had come along to get a flavour of the occasion before they go under the spotlight themselves. And it did not disappoint. It was one of Crowdcube’s regular monthly events that allow registered investors and investment seekers to get together in person for some important discussions. 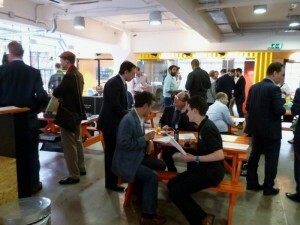 The funding seekers were spread around a few tables in a meeting area, some with samples of their products. Potential investors and the simply curious began to appear after 6.30 pm. Among the refreshments available was a Grind stand. Grind is a small group of espresso and cocktail bars that provide “beautiful spaces in London for eating, meeting and drinking. Their strong, bitter coffee cocktails with Icelandic vodka and Kahlua coffee liqueur were a new take on the classic Black Russian. They are seeking £750,000 through bonds that will pay 8% interest over four years. Is Joe Inglis on to a winner with a website, Qtsy, aiming to become a favourite for pet owners? They can post photos of their own pets, and vote on others. Votes win points and points mean prizes. Joe is after £150,000 for 12.5% equity. 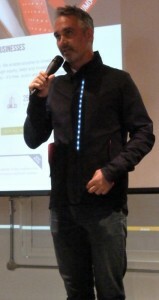 As a cyclist who has suffered from the actions of errant motorists (and an impatient passenger in a traffic jam) the Lumo Clothing proposition has strong appeal. Doug Bernier is targetting £200,000 investment for 14.29% equity in his company that produces washable bags and jackets for cyclists with built-in powerful LEDs to give added accident-avoiding visibility. This is clothing and accessories designed for the places you’re going to, not the archetypal cyclists’ bright coloured and skin-tight garb. You could wear it in Grind and feel at home. It may seem unfair not to mention the other projects seeking funding but I want to give you a flavour of the evening, not a blow-by-blow account of the whole proceedings. Though here is a line up of the entrepreneurs using this democratic source of securing funds to achieve their business aspirations. 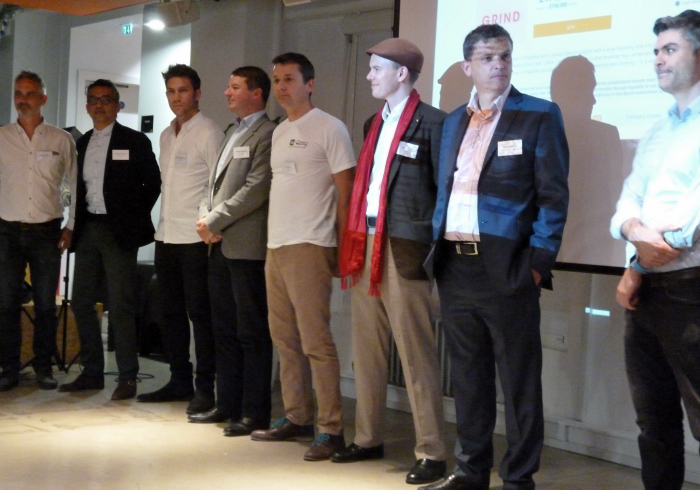 Left to right: Doug Bernier, Lumo Clothing; Hasan Mustafa, Collar Club; David Abrahamovitch, Grind; Richard Berkeley, Linkz; Joe Inglis, Qtsy; Alex Holland, Brew; Mark Aspinall, Extremis Technology; Sokratis Papafloratos, Togethera. Crowdcube does not allow questions from the crowd following the quickfire presentations. So you have to stay at the event and find the people you want to talk to. If you have any interest in raising money through crowdfunding, even if it’s on a donation basis rather than equity or loan, checkout how to attend on the Crowdcube website and get along to the next one. It will show you how high the professional bar is set to be a winner in this competitive arena. And if you want help or guidance with any aspects of crowdfunding, please contact me, [email protected]. Last year’s Office of National Statistics figures revealed that just 53% of the UK’s working population are fulltime employees with a regular pay cheque. More and more of us are choosing, or being forced by circumstances, to adopt alternative ways of funding our existence. The outcome can range from worries over simply paying basic bills to affording an enviable, comfortable lifestyle. I’ve learned that whether starting up in business as a small-scale entrepreneur of any age, or as a local provider of professional services, downscaling from a dazzling corporate career, or on the verge of what could be a great money-making venture, many of us all share the same feelings. Much of my networking in the first few months of Comanche Communications & Marketing was at a local SME level. I met many people who are or have been in similar circumstances to myself, setting out in business as a sole trader and trying to carve out a modest niche among the opportunities available within the accessible business community. Then I found myself networking in different company when I spent a day at the third annual Great British Workforce Revolution conference. These events are tailored around opportunities for former company directors to ‘go it alone’. This can mean starting a new business, investing in other people’s new businesses, or taking interim roles to guide companies unable to afford their experience and knowledge on an fulltime basis. A forum of former ‘captains of industry’ made some useful comments about the attitudinal re-think needed when making a career transition that are worth sharing with anyone who takes responsibility for their own destiny. Many people using crowdfunding hope it’s going to make a significant impact on their lives, but are they really ready for some of the consequences? The key ten points the panel made were these. It’s scary to be in a new place. Doing new things, outside of a comfort zone that may have previously been full of support, is scary. Most of your previous contacts become useless because they were part of that former comfort zone, that former life. It’s difficult to achieve a target daily pay rate, so do what comes up that looks like it would be good to be involved with. But don’t forget that time is your most precious asset, particularly if starting a new enterprise later in life. Reconsider the people who you know. Build connections among a new group of people who are going to be able to help you. Think about how to help them, not only how they could help you. You should remain curious and love learning. Which is now easier than it ever was with the range of material available through the internet. Add practice to your knowledge, by simply getting out there to start providing others with the benefits of your knowledge and skills. Even do it free for a local charity rather than keep them to yourself. This will help teach you how to best present that knowledge in a way that builds confidence. Confidence is what your new customers or investors will recognise and buy in to. Work with people you like, who respect you and pay you on time. Life’s too short to do otherwise. The Panel, left to right below: Steve Gilroy, Chief Exec at Vistage International (UK), the world’s leading Chief Executive organisation and main sponsors of the conference; Stuart Lucas, a former global finance high-flyer and Founder and Co-CEO of Asset Match which allows shareholders in unlisted companies to freely offer their shares for sale; Peter Collier, Executive Director and Founder of TCWM Ltd, held senior positions in the financial services sector until 2012 when after voluntary redundancy he started a business by taking small consultancy assignments; Robin Hill, Founder and CEO at Ruffena Capital Ltd, previously had senior positions in technology and media businesses. “It’s better to be more in control in a smaller company than lost in a big one,” he said. If you’d like to explore crowdfunding as a way to help you change your career path and want some objective advice and support then please get in touch. Drop a line to me at [email protected].